The unreleased track samples “Roll With The Punches” by Peverelist. 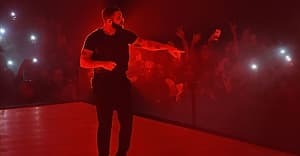 On Monday afternoon, professional boxer Gervonta Davis posted a video on Twitter of Drake and his crew jogging on a street at night, soundtracked by a new song. Watch it above via FACT. The beat on the unreleased track samples the 2007 dubstep track “Roll With The Punches” by Peverelist. It's not the first time the OVO camp has attached themselves to it: last year, Majid Jordan shared a remix of the track for OVO Sound Radio. After releasing More Life in March, Drake returned in the summer with "Signs," a song which debuted at Louis Vuitton's SS18 collection. The FADER has reached out for comment. Listen to Peverelist's "Roll With The Punches" below.